I know it’s been a little bit quiet around here–but know that things are always happening behind the scenes. There are blog posts written and never posted and concepts that never get fully fleshed out. One of the things that has been in the works for a while was this post from our friend Lisa Maderic. 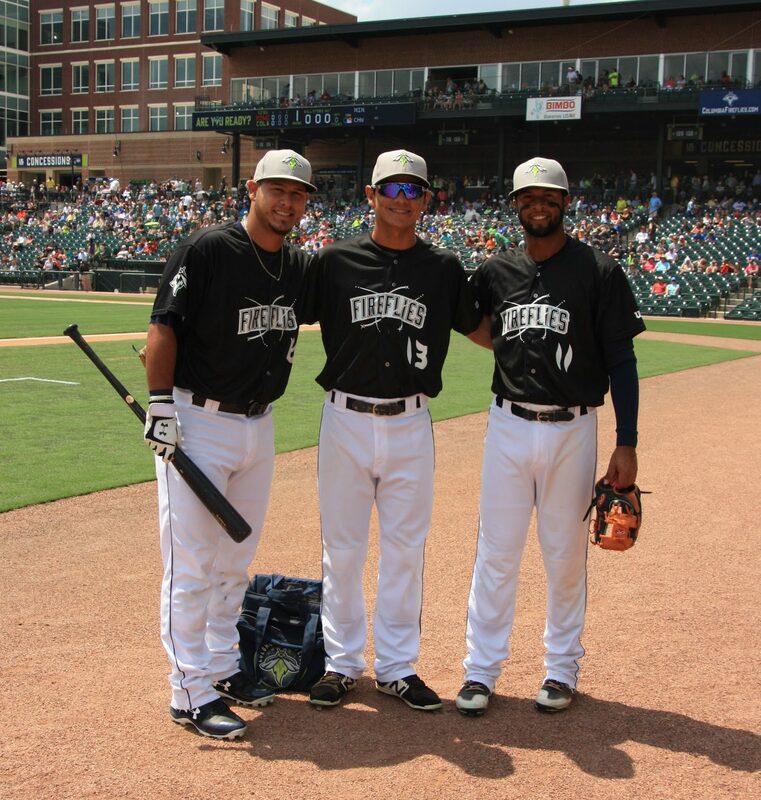 With help from the Columbia (SC) Fireflies and their media department, led by Mr. Kevin Fitzgerald, Lisa was able to get the access necessary to produce this post. It’s really great and I hope you enjoy it. 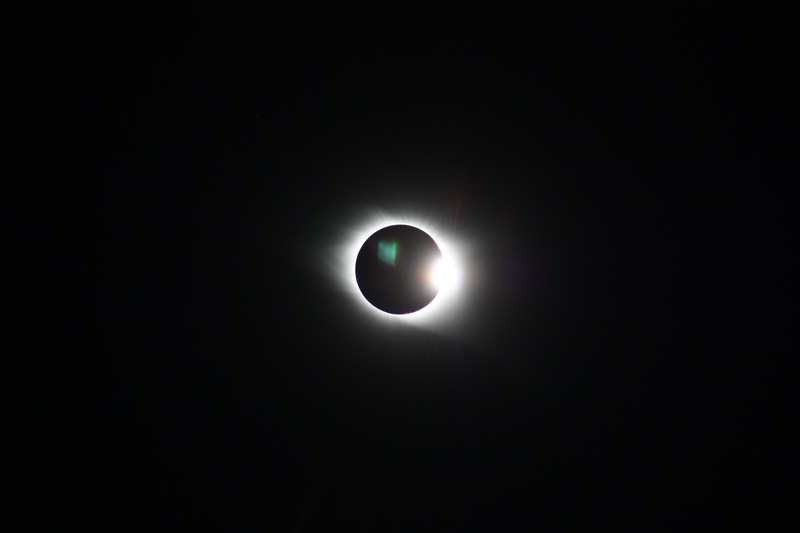 Total Eclipse in the Park – A worthwhile trip. Monday, August 21st proved to be an exciting day at the ballpark. 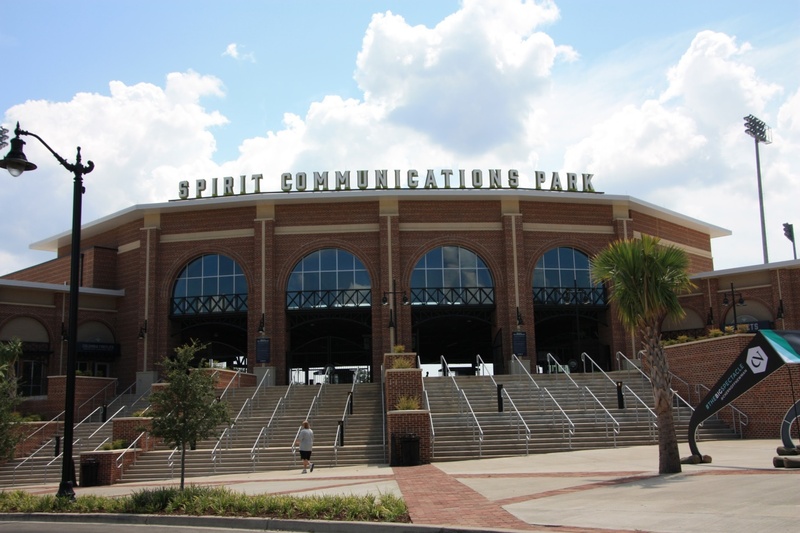 The ballpark – Spirit Communications Park in Columbia, SC, home to Columbia Fireflies, a South Atlantic team of the New York Mets. 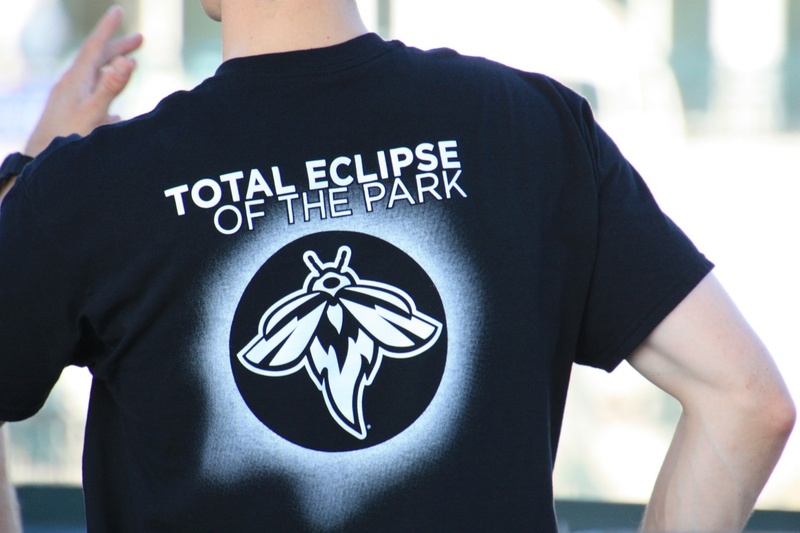 The Fireflies took advantage of the timing of the solar eclipse and branded that day, Total Eclipse of the Park. Columbia, SC was listed as one of the premier locations to view the solar eclipse. Columbia sat in the line of totality and the total eclipse would last a full 2 minutes and 36 seconds, the longest anywhere in the United States. 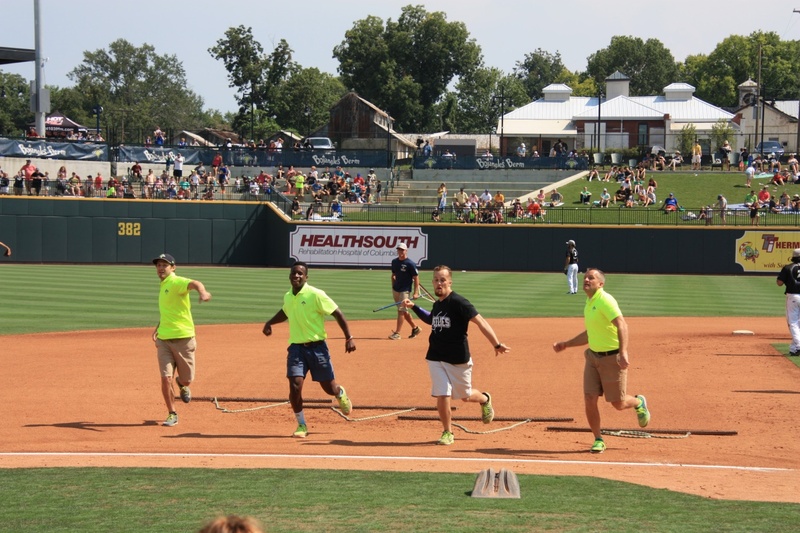 The Fireflies took on the Rome Braves in a 1:05 game. The ballgame was halted for an “Eclipse Delay” as totality approached at 2:41:51 pm. Though very hot that day, the skies cooperated and put on an amazing show. 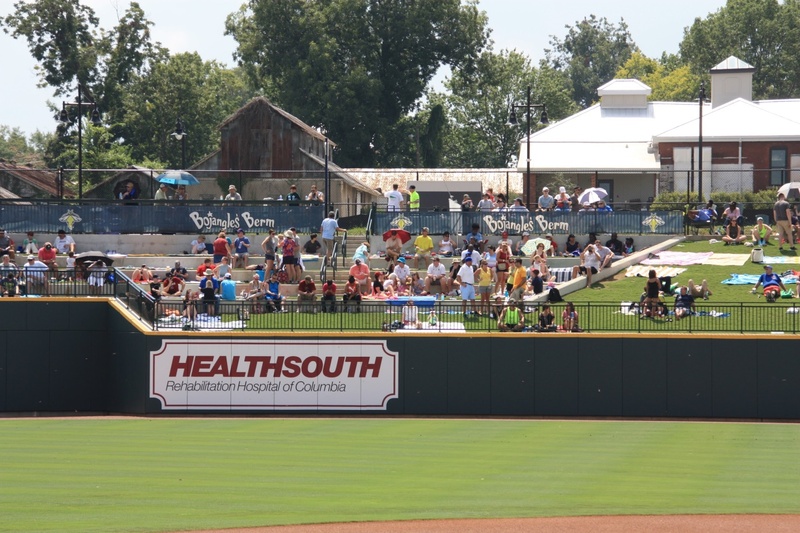 This ballpark was opened in 2016 and won the 2016 Ballpark Digest Ballpark of the Year award as well as Ballpark Digest’s Best New Branding and Logo award in 2016 during its inaugural season. This year it hosted the Single A All Star Game. Even if you’re not a Mets fan, I am still sure you have heard of the Columbia Fireflies as Tim Tebow fever took over the stadium when the Mets assigned him to the Fireflies. He played half a season there before being promoted to the Port St. Lucie Mets. After taking a tour of the stadium, it was easy to see why it won the best ballpark award. There is free ballpark Wi-Fi for all fans with a terrific connection. In the upstairs club area, the inside air conditioned seating area has both comfy seats for the casual observer and tables to enjoy your meal while able to see the entire field. Big screen TVs hang on several walls following the play by play action. 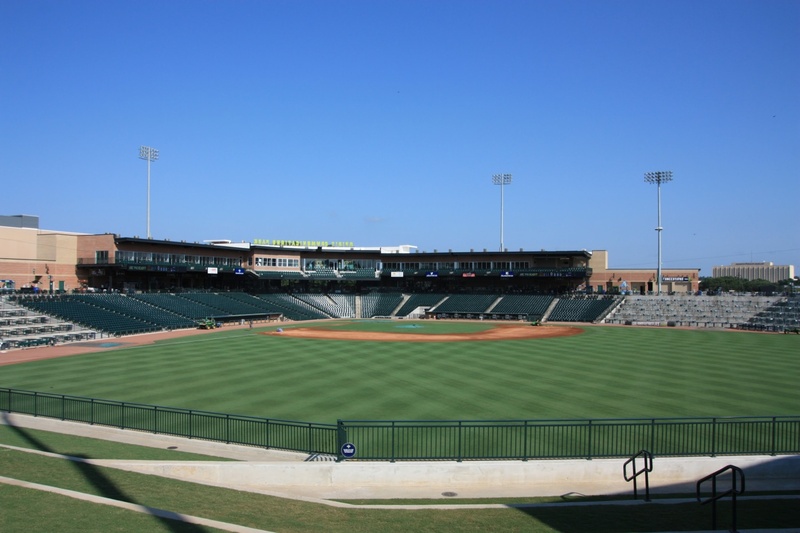 The stadium boasts to be the most technologically advanced ballpark in the minor leagues. The lower level concourse is a 360 walk with a tiered “Bojangle’s Berm” (grass seating) in the outfield. A large video board in left center field is brimming with facts, stats and the current score and is easily located for everyone to see. The seats are comfortable with a net stretching from the far end of the dugout all the way to the far end of the opposing team’s dugout. Spirit Communications Park reminded me a lot of Coca-Cola Park in both the available amenities and on-field promotions. We have the dancing Dirt Dudes and they have the Fly Guys. Although the Fly Guys have more rhythm, both are fun to watch. The Fireflies use the tag #LETSGLOW on their social media platforms. Just like the IronPigs, they have a team store named the Mason Jar with a statue of Mason, the Firefly mascot outside the store. 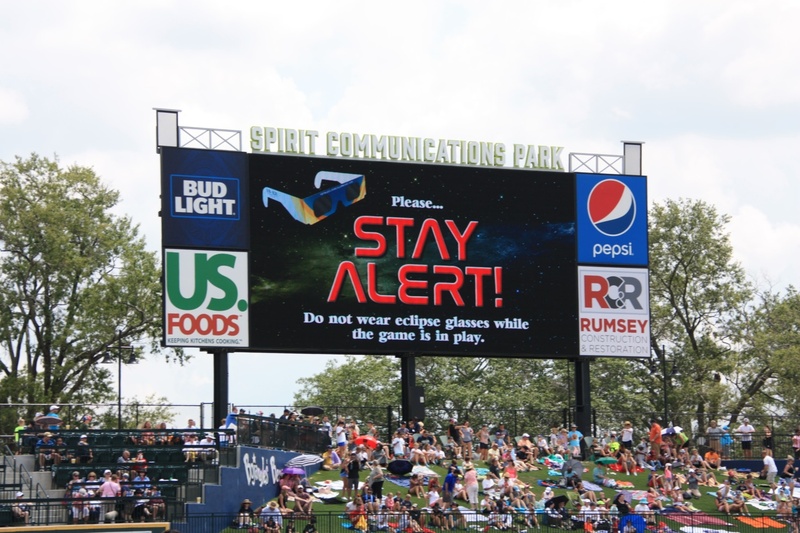 Spirit Communications Park was one of the 5 minor league parks playing a home game in the path of totality. Every person entering the stadium received a pair of eclipse viewing glasses. 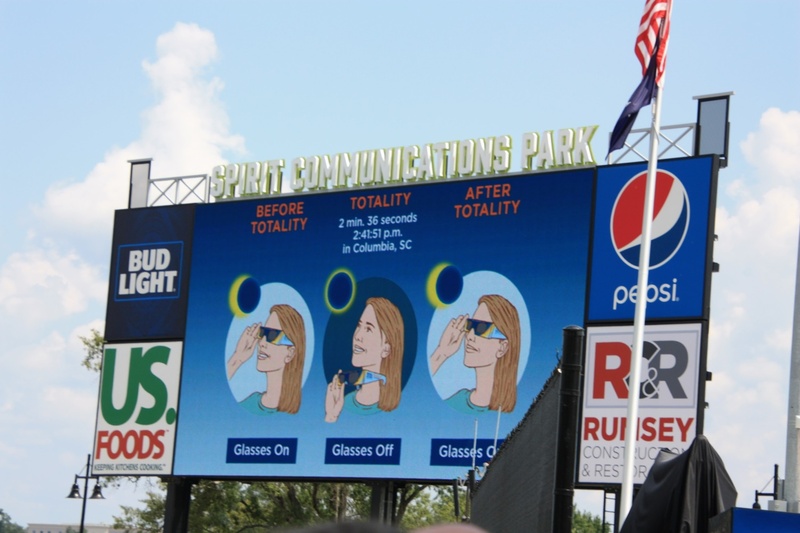 Prior to the game, the Fireflies hosted a iMAGINE STEM (Science, Technology, Engineering and Mathematics) Festival where kids and adults could participate in eclipse themed interactive activities. I must admit, I knew this game was going to be well attended but I was not prepared for the overwhelming amount of people streaming into the ballpark gates when they opened at 10:00am. The team store was immediately overwhelmed with people and the promotional t-shirts for sale were gone before they all made it to the sales rack. 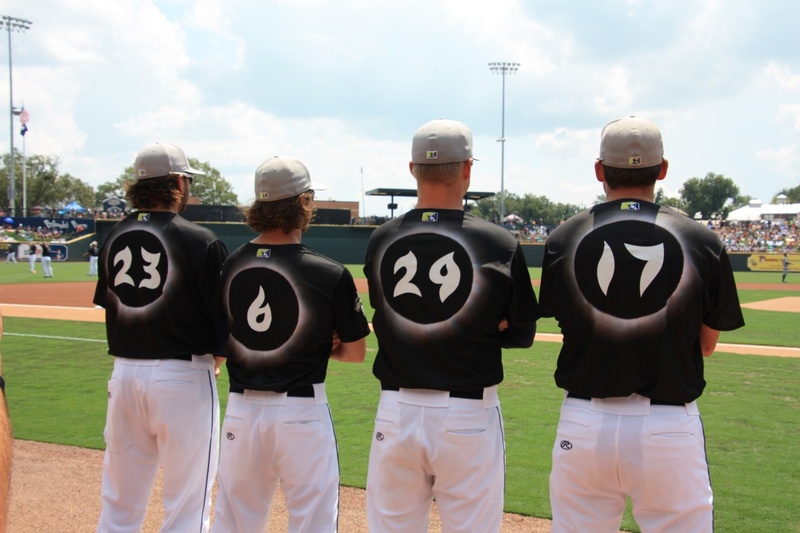 The Fireflies players sported Glow in the Dark eclipse jerseys. The jerseys were black and the number and graphics on both the front and back glow in the dark. The larger number on the back of the jersey overlapped a beautiful sketch of the moon covering the sun, only showing the sun’s corona. These were auctioned off during the game via text message benefiting STEM centers of South Carolina. The players were accommodating as they posed for pictures and requests for autographs. The players seemed genuinely excited about the natural phenomenon that all were about to witness. 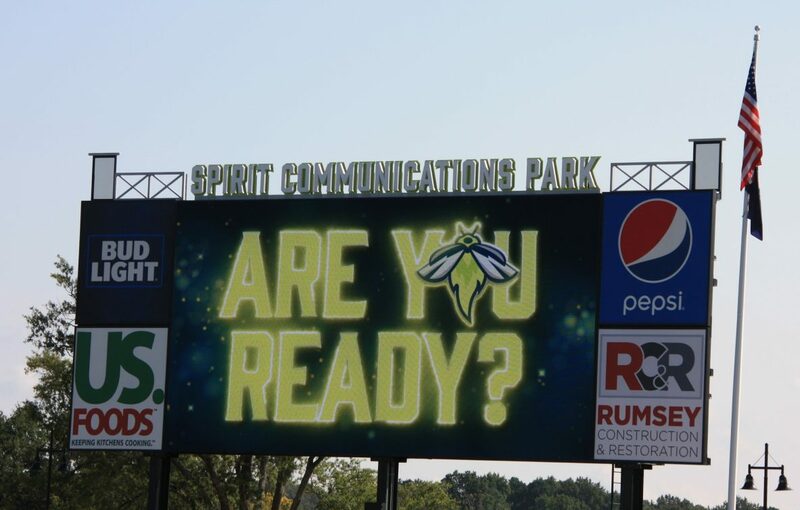 The seats may have looked empty due to the extreme heat, but the park was full of 9,629 enthusiastic fans, the largest crowd ever at the Columbia Fireflies, ready for the baseball game that would be interrupted for a spectacular lunar show. Throughout the game the announcer kept stressing to not wear eclipse glasses while the game was in play, but it was hard not to sneak a peek. Yes there was time in between innings, but I have to admit it was hard to avoid the urge to peek at the eclipse as it moved towards totality. After 3 1/2 innings of play with 6 minutes to go before totality, the game was halted in anticipation of the eclipse. The players from both teams grabbed their eclipse glasses and laid on the infield grass ready to view the full solar eclipse. Then, the most amazing scene I ever witnessed at a baseball stadium occurred. Both fans and players alike cheered as the eclipse darkened the sky from twilight to total darkness. Then a hush came over the stadium. The stars appeared in the sky and a ring of light surrounded the moon. The largest crowd in Fireflies history removed their glasses and stood in amazement witnessing this awe-inspiring event. Special thanks to Kevin Fitzgerald, Broadcasting and Media Relations Director from the Columbia Fireflies Baseball for all of his help and to KRAM for his incredible assistance in getting this piece produced. Smashing job by Lisa! I figured someone from our midst had made the journey to the path of totality! And kudos to the “Sally” and the teams for helping make it a wonderful time for fans!